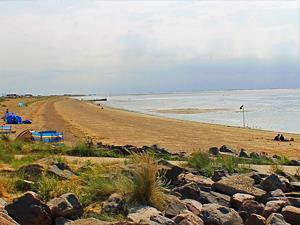 Heacham Beach01485 532610work BeachHeacham started to become popular as a seaside resort with the Victorians due to the opening of the railway line between King’s Lynn and Hunstanton in the early 1860s. Today the north Beach has an amusement arcade, café and fish bar and beach huts for hire. South Beach has its own café/gift shop and both beaches have public toilets. Both North and South Beach face West, looking across a huge bay area. This is shallow, sheltered water - not open sea - giving the beaches a safe, sheltered feeling and providing a perfect area to see impressive sunsets. Heacham started to become popular as a seaside resort with the Victorians due to the opening of the railway line between King’s Lynn and Hunstanton in the early 1860s. Today the north Beach has an amusement arcade, café and fish bar and beach huts for hire. South Beach has its own café/gift shop and both beaches have public toilets. Nearest town is Hunstanton. There is a bus service to and from Hunstanton and Kings Lynn with a short walk from the village centre (0.5 mile to the beach). In Heacham there are two pay and display car parks. Charges apply 24 hours a day, seven days a week including public bank holidays. Charges also apply to Blue Badge holders. Ticket machines only accept cash and no change is given. North Beach, PE31 7LJ, 80 spaces, 4 disabled spaces. South Beach, PE31 7LH, 20 spaces, 2 disabled spaces.